If researchers could distinguish the membrane alterations of chemically treated cancer cells, they could quickly determine how that chemical compound brings about the cells’ death. A new sensor developed by a research team led by Vincent Rotello of the University of Massachusetts Amherst can make these distinctions in minutes. The sensor consists of blue, green and red fluorescent proteins bound to a gold nanoparticle. While attached to the nanoparticle, the proteins lose their ability to fluoresce. 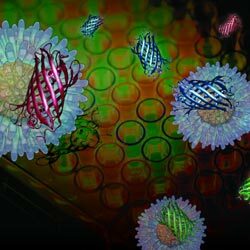 When the scientists add the sensor to cancer cells treated with a chemical compound, the nanoparticles attach to the cells’ membranes and shed some of their fluorescent proteins. The exact proportion of each of the three types of protein released depends on the strength of attraction between the nanoparticle and the cell, which varies according to how each compound affects the cell membrane. Once released from the nanoparticle, the proteins fluoresce again, displaying unique patterns of colored light for distinct methods of cell death. Using this sensor, the scientists identified light patterns broadly associated with apoptosis and necrosis, as well as with more specific mechanisms of cell death within each of those groups. They found that their sensor was effective at distinguishing the mechanisms of individual drugs as well as combination therapies involving multiple drugs. This work was funded in part by NIH under grant R01GM077173.